This is another reissue of the 1987 album that found this avant super-trio in what was (and still is) unlikely territory, not only playing bebop, but also pouncing on a less than obvious repertoire. Four composers were selected, their hardboppin’ tunes more or less equally divided, with around four numbers each from trumpeter Kenny Dorham, tenor man Hank Mobley and pianists Freddie Redd and Sonny Clark. These recordings were made during the peak period of Zorn’s Naked City thrashcore band (which also featured Frisell) and even though these two had regularly toyed with the jazz mainstream, it was particularly unusual to find Lewis in such a setting without dismantling his trombone or feeding its sounds through a computer program. Even though the compositions are negotiated in boppish fashion, with tightly interlocked themes, Zorn still can’t resist leading an occasional foray into freedom, usually making such squalling flurriesduring a tune’s final minute. Lewis will follow,burbling and spluttering with a real-time succinctness to his self-editing scalpel. Otherwise, they’re negotiating a drummerless pulse, swinging strongly as they indulge in a quick-witted speed-dialogue, finishing each other’s phrases and building up each tune’s rolling momentum as a co-operative effort. Zorn and Lewis keep together quite closely, in a racing conversation that coincides or diverges with supple ease. Frisell is positioned in the stereo center, subdued in the mix and providing a backgrounded rhythmic chop, even if he’s not exactly fixed down in his duties. The four live bonus tracks have the guitarist’s volume increased, but their feel is very similar to that of the studio session. 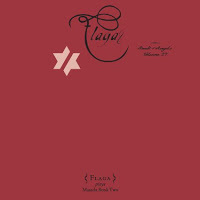 All the pieces are around three or four minutes long, imbued with an exhilarating brevity. Every lick counts. The numbers are tuneful, breezy and fluid, the lineup allowing for great mobility around the implied motion of the beat. Zorn frequently issues comedic rasps, clowning with Lewis, while Frisell makes gently fragmented strokes, softly subverting the horn exchanges. 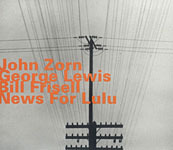 Zorn is at his most bluesily soulful, Lewis is hearty and avuncular, Frisell wobbles as he needles. The silliest outbreak is during “Peckin’ Time,” when Zorn initiates a clucking farmyard squabble. Then, trombone and guitar form an unusual alliance on the title cut, cutting Zorn free to solo separately. These compositions all sound very familiar and this can’t be because they’re aired very often on the bebop stage. 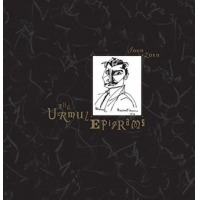 This has become an oft-visited disc in the collection, but its tunes surely deserve greater use as standards, either because they’re real hard bop classics or because they exist as prime distillations of archetypal bebop moves. It’s hard to tell which is which and why they sound so amazingly compulsive.